Krush has company. Last year, the having-a-bucket-of-tropical-juice-dumped-over-your-head pale ale of that name became the first KAIJU! release to appear in a can – and what a fine looking can it is too. It was no one-off, no cashing in on the arrival of East Coast Canning on the scene, but rather a sign of where things are heading for the brewery that burst onto the scene with a double IPA and has continued to launch hopped 'n' boozed up beers ever since. 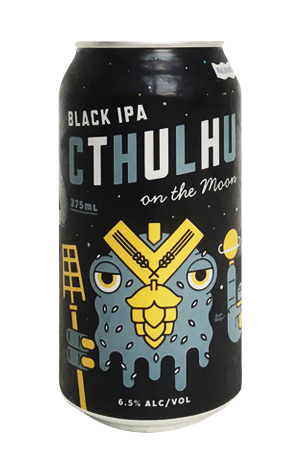 If you're a fan of such beers, it can be hard to pick a favourite, although we've long had a fondness for Cthulhu, the black IPA that now becomes the second KAIJU! tinnie. The beer itself hasn't changed, although clearly the beer landscape continues to do so if we're ready for a 6.5 percent ABV black IPA in a can. Cthulhu still offers up the combination of aromas and flavours only a hearty BIPA can deliver, roaming from herbal, resinous hops to roasted malt, dark chocolate, mint and a hint of tobacco, all carried on an almost tar like body. You'll get more out of it aroma wise if you pour it into a decent glass, but the intensity and length of flavour remain if consumed straight from the can too.